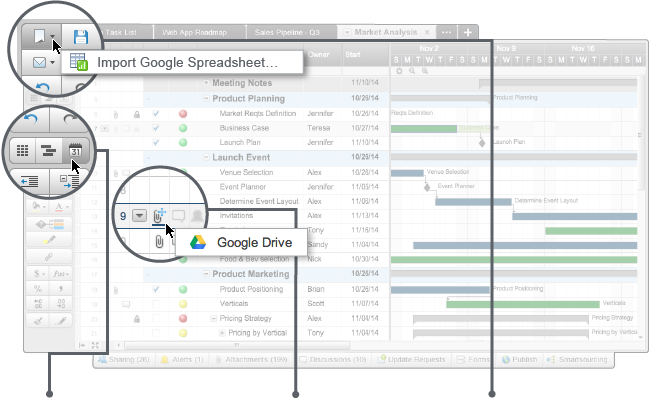 Smartsheet is seamlessly integrated with Google Apps, giving you the power to collaborate, track and manage using the tools that work best for you. Single Sign On: Hassle-free sign-on so your team is instantly productive - collaborating on project tasks, files and discussions. Google Drive: Attach any type of file or Google doc directly to each row and create a new Smartsheet directly from Drive. Gmail: Import Google Contacts and update project information straight from Gmail. Calendar: Sync your project plan with your Google Calendar to get a weekly or monthly perspective of progress.